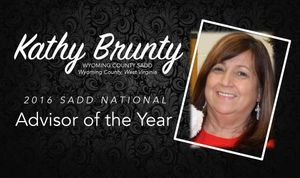 So excited to announce Wyoming County's SADD advisor, Kathy Brunty, received the National SADD Advisor of the Year Award for 2016. We are so proud of her! Update: We are cleaning and remodeling the Power House in Oceana and hope to open sometime this summer. Community volunteers are appreciated as well as any cleaning supplies and donated items that would benefit the center. Thank You! We have recently obtained another facility to be located in Oceana, WV. Both centers will be operated by volunteers and will provide programs to our local youth. Power House West located above Uncle Tom's Loans in Oceana, WV. Coming Soon.